What is 200 Times Stronger Than Glass? At AB Northern, we constantly keep right in touch with all of the developments relating to the many sectors of industry that we supply to. Part of this dedication to remaining at the cutting-edge is a constant reevaluation of our product portfolio, adding new products all the time in order to further improve your level of choice. We are excited to announce a brand new product range coming to our website very soon: get ready for clarity with strength, resilience with aesthetics…. Polycarbonate is coming your way. Polycarbonate is a revolutionary material that has thousands of uses across the broadest range of sectors from the domestic and commercial to industrial. An extremely high-performance plastic, polycarbonate is set to transform the way you work and AB Northern are with you all the way. 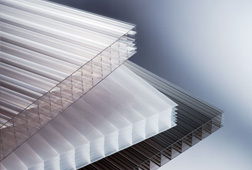 Polycarbonate is available in sheet form, to your required length. Polycarbonate is headed for our website as we speak so make sure you are subscribed to our newsletter to be the first to find out when it is available, at the signature AB Northern fair, realistic and competitive price. Sign up today and look forward to a clearer future!